Do love snowmen decorations in the winter? Me too! 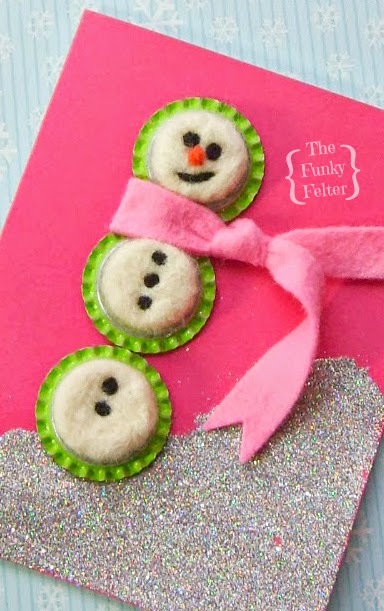 Whip up this quick and easy needle felted snowman card in no time! I don't know what it is about snowmen this year, but I am loving to make them. Big ones, small ones, with crocheted yarn, with felted beads, with men's tube socks (yes, with socks! )...you get the idea. There are currently a lot of snowmen decorating my house. This needle felted snowman card using bottle caps is from last year. I made it for a very good friend of mine that I cherish. Honestly, I am not much to send out commercial Christmas cards, but I love to make a special few handmade Christmas cards to gift to my very good friends. 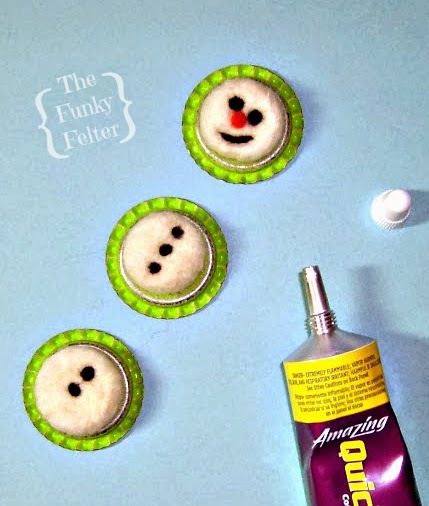 CLICK HERE for the needle felted snowman craft tutorial.